Elizabeth Loftus – "Joseph Priestley Award"
Sponsored by the Department of Psychology. People have been led to remember non-existent events from the recent past as well as non-existent events from their childhood. They can be led to falsely believe that they had experiences that would have been highly traumatic had they actually happened. False beliefs have consequences for people, affecting later thoughts, intentions, and behaviors. 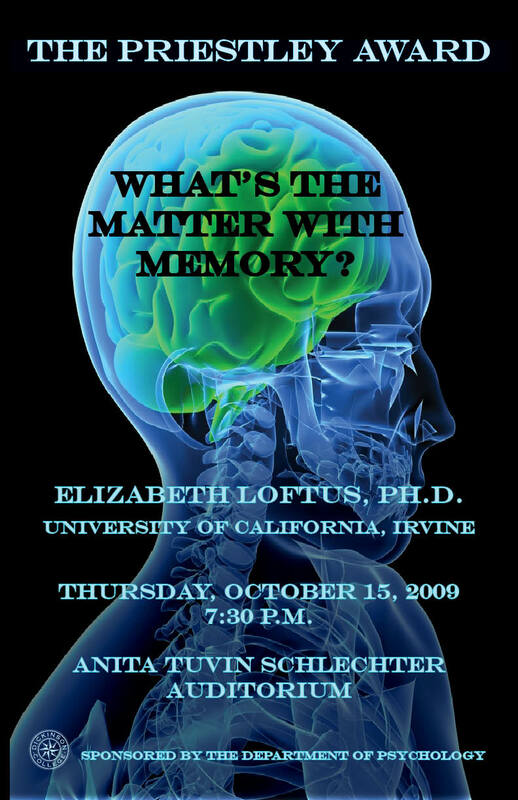 Elizabeth Loftus, distinguished professor at the University of California, Irvine, holds positions in the Departments of Psychology & Social Behavior, and Criminology, Law & Society. She is also a professor of law. She has a faculty appointment in the Department of Cognitive Sciences and is a fellow of the Center for the Neurobiology of Learning and Memory. Formerly, she was professor of psychology and adjunct professor of law at the University of Washington, Seattle, where she taught for 29 years. She received her Ph.D. in psychology from Stanford University. Since then, she has published 22 books and over 450 scientific articles. Her 4th book, Eyewitness Testimony, won a National Media Award (Distinguished Contribution) from the American Psychological Foundation. One of her most widely read books, The Myth of Repressed Memory (co-authored with Katherine Ketcham) was published by St. Martin’s Press and has been translated into Dutch, Taiwanese, French, German, Japanese and other foreign languages. Loftus has been an expert witness or consultant in hundreds of cases, including the McMartin PreSchool Molestation case, the Hillside Strangler, the Abscam cases, the trial of Oliver North, the trial of the officers accused in the Rodney King beating, the Menendez brothers, the Bosnian War trials in the Hague, the Oklahoma Bombing case, and litigation involving Michael Jackson, Martha Stewart, Scooter Libby, and the Duke University Lacrosse players. Loftus also she has worked on numerous cases involving allegations of “repressed memories”, such as those involving George Franklin of San Mateo, California, Cardinal Bernardin of Chicago, and Gary Ramona of Napa, California. Loftus’s research of the last 20 years has focused on human memory, eyewitness testimony and also on courtroom procedure. Her work has been funded by the National Institute of Mental Health and the National Science Foundation. In 1983, she was invited to present this work to the Royal Society of London. She has received six honorary doctorates for her research, the first in 1982 from Miami University (Ohio), the second in 1990 from Leiden University in the Netherlands, and the third in 1994 from the John Jay College of Criminal Justice in New York – an honorary doctorate of laws. Her 4th honorary doctorate, from the University of Portsmouth in England, was awarded in l998; the 5th, from the University of Haifa is Israel, was awarded in 2005; the 6th from the University of Oslo was awarded in 2008. She served as the 1984 President of the Western Psychological Association, and again as President during 2004-05. She was the 1985 President of the American Psychology-Law Society (Div 41 of APA), and the 1988 President of Division 3 (Experimental) of the APA. Finally, she was President of the Association for Psychological Science (APS) during 1998-1999. In addition to the honorary degrees, Loftus has received numerous awards and honors for her research. In 1995 she received an award from the American Academy of Forensic Psychology – their Distinguished Contributions to Forensic Psychology Award. In 1996 she received the American Association of Applied and Preventive Psychology (AAAPP) Award for Distinguished Contribution to Basic and Applied Scientific Psychology. In 1997 she received from APS the James McKeen Cattell Fellow (“for a career of significant intellectual contributions to the science of psychology in the area of applied psychological research”). She received the William James Fellow Award from the APS, 2001 (for “ingeniously and rigorously designed research studies…that yielded clear objective evidence on difficult and controversial questions.”). In 2002, the National Academy of Sciences bestowed upon her the inaugural Henry & Bryna David Lectureship (an award for “application of the best social and behavioral sciences research to public policy issues”) The article that she wrote in conjunction with this award was subsequently selected for inclusion in The Best American Science and Nature Writing. In 2003, the same year that she received the APA Distinguished Scientific Award for Applications of Psychology, she was also elected to membership of the American Academy of Arts & Sciences, and the American Academy of Political and Social Sciences. In 2004 she was elected to the National Academy of Sciences. In 2005, she won the Grawemeyer Prize in Psychology (to honor ideas of “great significance and impact”), and with it came a gift of $200,000. Also in 2005 she was elected to the Royal Society of Edinburgh, which is Scotland’s national academy of sciences and letters, established in 1783. Also in 2005, she received the Lauds and Laurels Faculty Achievement Award less than three years after arriving at the University of California, Irvine. The award “recognizes a faculty member who has achieved great professional prominence in their field for their contributions to research, teaching, and public service….a role model and has contributed to the excellence of UCI.” She was the 9th recipient of the award in the history of the University. In 2006, she was elected to the American Philosophical Society, which is the oldest learned society in the United States, Est. 1745 by Benjamin Franklin. In 2009 she received the Distinguished Contributions to Psychology and Law Award from the American Psychology-Law Society. Visit http://www.dickinson.edu/news/priestley/ for more information about the Joseph Priestley Award and a listing of past recipients.